While once an easy means of entry, cybercriminals are starting to find the browser vulnerabilities they once leveraged to gain entry to your network much harder to penetrate. This is due in large to capabilities popular browsers have added to enhance security. While not a bulletproof strategy, these security improvements are certainly helping in the war against cyber-crime. 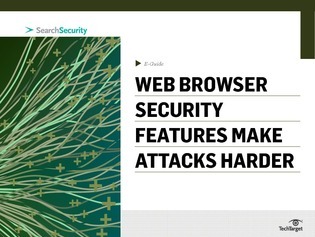 This e-guide from SearchSecurity.com explores the features Microsoft Internet Explorer, Mozilla Firefox, and Google Chrome are developing that are making the job of the attacker much harder.